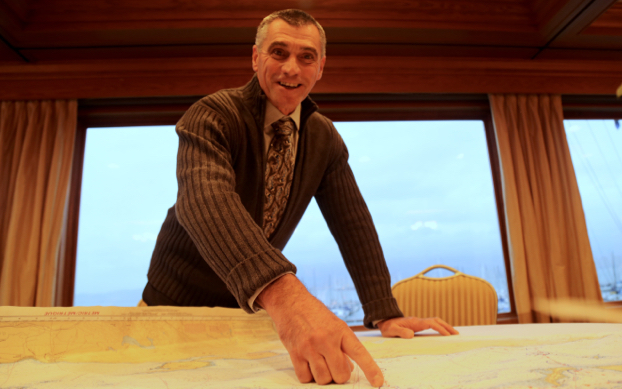 Citizen scientist Ed Oldfield shows the routes his boat covered over the Salish Sea Marine Survival Project’s citizen science program. The lightning storm brewed over a glowering ocean. Billy McMillan saw the clouds and knew there was only one option: forward. “We were stuck between the storm and our next sampling site,” said McMillan. With a sense of adventure, McMillan and his deckhand Ted Newell navigated around the outside of the storm to reach their destination. All in pursuit of science. Citizen science to be precise. A project in which non-professional scientists participate in scientific research. 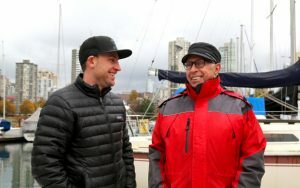 McMillan, 34, and Newell, 73, were part of a nine-boat fleet of citizen scientists who took to the Strait of Georgia to collect data for the Salish Sea Marine Survival Project. Citizen scientists, people who had boats of their own that could be deployed, were recruited by the Pacific Salmon Foundation to help gather data on everything from ocean temperature to plankton presence all over the Strait of Georgia, the body of water between Vancouver Island and the mainland. The project began in 2015 and data collection just wrapped up. Over three years, the citizen scientists travelled across thousands of miles of ocean to obtain over 24,000 oceanographic samples. The data will be studied and analyzed to to better understand how the ocean works and why salmon stocks are declining. “I thought it would be great to be part of something that helps my livelihood as well as something I love which is Pacific salmon,” said McMillan, a part-time fishing guide. Using citizen scientists was a way to strategically sample a vast area of ocean – the Georgia Strait has a surface area of approximately 6,400 square kilometres. “I don’t know of another oceanographic project that has achieved this level of spatial and temporal coverage in the Strait of Georgia,” said project co-ordinator Isobel Pearsall. Coverage of sites sampled by the citizen science project in 2016. Open access data by Pacific Salmon Foundation. This project’s unusual achievement started with the citizen scientists learning how to collect data. They were provided with training on the boat as well as an oceanographic manual. John Field, 65, holds a PhD in zoology and is no stranger to science. In contrast, Ed Oldfield, a 62-year-old retired art teacher, found the learning curve steeper. 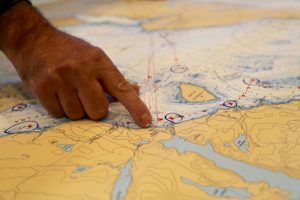 Ed Oldfield points on a nautical chart to where the Powell River crew set sail. One way of collecting data involved lowering oceanography instruments into the water to measure properties like temperature and pressure. As the project progressed, Oldfield and his crewmate, John Sinclair, 69, became more efficient. They expanded their original 105-kilometre Powell River route to three routes totalling 225 kilometres and 22 sampling sites. When the weather was kind and the sea was flat, this would take nine or 10 hours. The hours that Oldfield and Sinclair spent on the water amounted to almost 4,700 kilometres this year. “For some people, that would be the trip of a lifetime,” said Sinclair. One of the highlights was seeing wildlife, from humpback whales to harbour seals, sea lions to seabirds and orcas to porpoises, up close. On their very last day of sampling, the pair had just left the harbour when they came across a humpback whale. On their return to the harbour, they saw several humpbacks. “It was like they were saying ‘Good morning’ to us and ‘Goodnight, have a good day,’” said Oldfield. Billy McMillan and Ted Newell laugh together on McMillan’s boat at Burrard Civic Marina. The project also forged strong relationships between crew members. “That was one of the best parts,” said Oldfield, who has known Sinclair over 20 years. McMillan and Newell, on the other hand, met through the project. The data collection is over but this isn’t the end of the story. A citizen-science symposium takes place in Nanaimo on Nov. 27 where participants will connect with research scientists like Rich Pawlowicz. The University of British Columbia professor says their contribution has been an amazing one. Sinclair especially has had cause to more deeply contemplate his contribution to science. Just weeks after the completion of data collection, Sinclair had a heart attack, from which he is now recovering. That prompted him to reflect more on his role in the project.